Summer is usually the time to rest, travel and go through your creative commute in your own pace. Or maybe go for a creative adventure to step up your game! Unfortunately, when it comes to Animation, the choices are a bit scarce- especially if you just got into this creative path. So rather than an internship, you might want to attend a summer school to learn more about your subject. Yet, most summer schools on Animation are truly beginners’ level, which might not be what you are looking for as a student or professional. But hope is not lost. I would like to slide a consideration on your way, dear reader, which you should definitely consider. 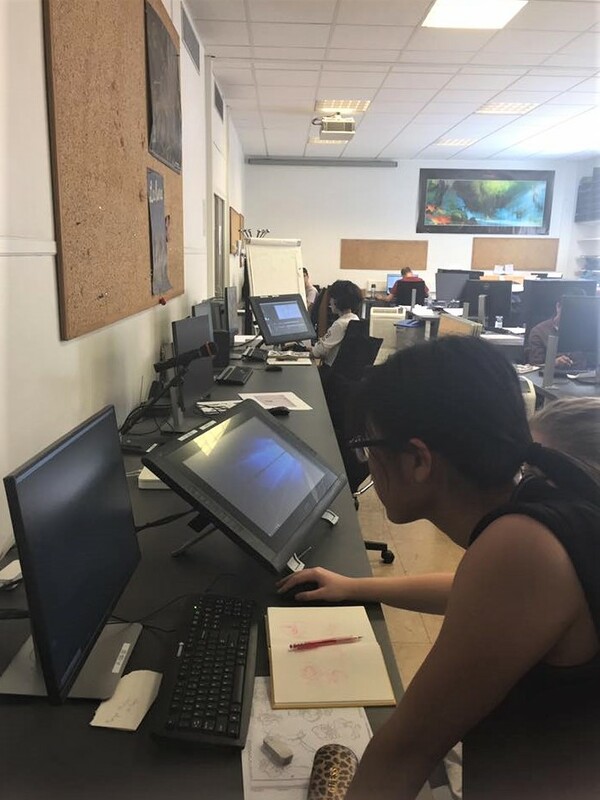 There is one Summer school in the dream city of Paris, which goes about this in a very professional way: Gobelins Summer School Animation. I learnt about this course when I was bouncing around on the school’s website. I just thought it was the perfect opportunity to sharpen the skills I got from Year 1 in NUA. So I prepared a portfolio on January (with the help of NUA Animation Lecturer Helen Piercy) and went on the adventure. 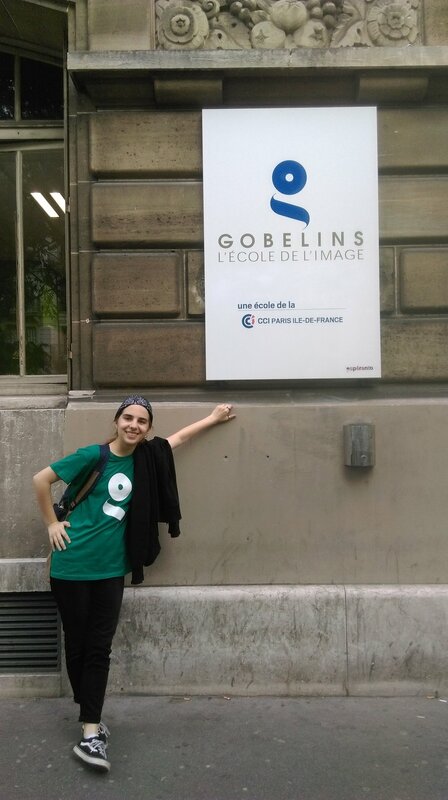 It is a two-week intensive course, held in Gobelins d’École d’Image in Paris. On the course you are given a task that should be completed within the two-week period. You also get to attend conferences in the mornings, given by people who teach at the school and/or still actively work in the industry. This might sound like a very classic, bit boring summer school but it’s definitely not. From the opening conferences and start talking with people around, you started to get immersed into the experience. After the relaxed first day of conferences, we got our task on Tuesday. Our task was to animate a 3-5 second animation. A choice of characters with model sheets and a background with three props to interact with was given as the only restriction (PS: The content of the task changes every year.) The lecturers want you to take it easy and not rush the process, making your keyframes and breakdowns solid and expressive. On your way, you will get a lot of things to consider and a lot of feedback from both lecturers and your coursemates, which will drive you to change your animation and your perspective on creating animation. It is an open environment with people who love animation and work hard for it, so feedback is honest and kind. Conferences were one of the best part in the course. Over the two weeks, people from the industry (some also teach at Gobelins) come and give their perspective on creative progress and share stories (and horror stories) from their part of the industry. My favourite talks were by Sergio Pablos (Despicable Me, upcoming Klaus) and Florent de la Taille (Secret Life of Pets). Pablos’ view on animation and storytelling, I found it more close to how I am and what I want to do in life. He also showed a (personally) more realistic insight on running an independent company in this day and age. He talked about how to make a good pitch to present and how to create good characters. Florent’s presentation was spread over two days, and talked more on the practical side; How to build a scene? How to choreograph your shot? How to go about Keyframes, Breakdowns and Inbetweens? He also answered a lot of questions we had, and his delivery was fun, friendly and hilarious. In every conference, you also get to have a small insight on the daily life of development - even from rather new projects that will be coming soon! And of course, the coursemates. You will be surprised how many people from very different countries (China, Spain, Brazil, Saudi Arabia, US and more...) and very different age groups (We had a few high school students to one architect in his mid 50s). This much diversity teaches you what is going on around the world and learn more about other cultures as well. Every person can inform you in a different subjects or make you consider different ways of looking at a subject and Animation. The adventures you go on with your new friends at the weekends, evenings or even in the morning commute together (in my case) through Port-Royal - sometimes just to gush about what was shown in the conference or rant about simple daily problems. It gives you power, that you are not alone. There is this large table to share ideas, the hidden gems you found, an open space to voice opinions and more. Lecturers are also very sweet, open and some has very interesting life stories to share. What better environment to learn and have fun at the same time! Long story short, summer school is a great way to socialise with the people, talk to people working in the industry and sharpen your Animation skills. It was definitely an eye-opening experience, learning more about the industry on other countries, how to approach the Animation process and improve upon both theoretical and practical aspects of the subject. It’s a fun experience to go about your summer while growing your work. If you feel like going on an adventure and improve upon your creative practice, Gobelins Summer School is a good one to get involved in. Get yourself ready: It is true that summer school is still much more relaxed than the normal school, you still gotta do some work! Try to keep your habit of drawing and animating to ease your way into the course. Also, bring a notebook and sketchbook to take notes - you will learn a lot! Have an open mind: People from all over the world, from all sorts of backgrounds come to these courses. Some are university students, some are already professionals, some are just finishing high school - any of them can teach you something new and interesting, and are very able to give you feedback. As our lecturers say, “Kill your ego” and be a sponge of information and perspectives. Talk and engage: When taking a small break, look around your classmates’ work, or have a small talk. Eat lunch with them. Share things with them. Go on adventuring the city with them. At the end of two weeks, you will be closely-knitted group hugging each other, crying over the fact that it is the last day. Enjoy! If you are considering an internship or a summer school, you are already achieving a lot. You decide to leave your comfy home in the heat of summer, to explore the lands of Animation. You are in the city of Paris in a nurturing environment, surrounded by other adventurers as excited as you. Work hard, explore hard and enjoy your time!